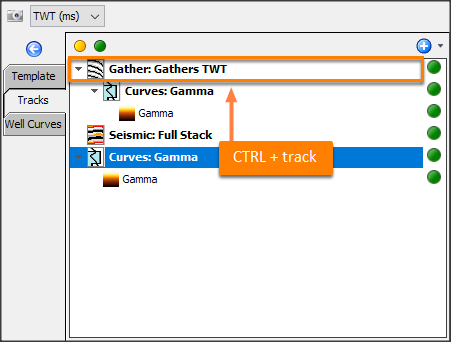 By adding sub-tracks, the seismic/gather track overlays logs, curves, tracks over seismic or gather data. 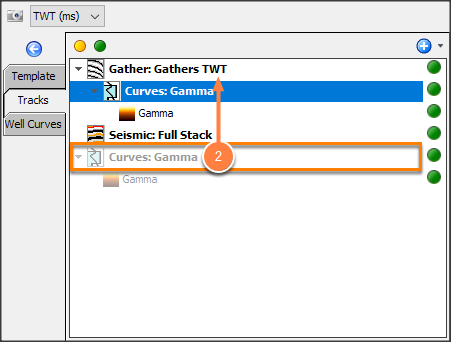 Seismic/gather tracks act as containers for other tracks, such as axis tracks and well curve tracks. Note: See Curves tracks for more information on using curves tracks and more details on dragging and dropping in the well views. Create a curve track using the context menu. This creates a curve track over the section. 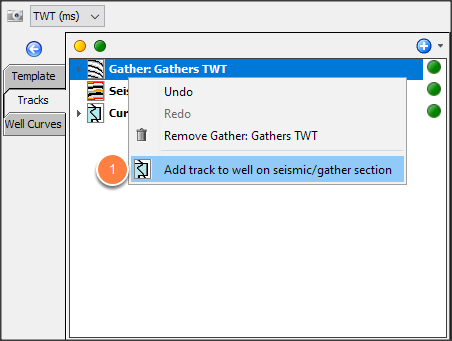 Right-click the seismic/gather track and select Add track to well on seismic/gather section. Move a track from the main display to the section using the tree. Copy a track from the main display to the section using the tree. Note: Copied and moved tracks use their original width. Tracks often need their width adjusted after being adding to a track. Select the track and adjust the width setting until it displays correctly.